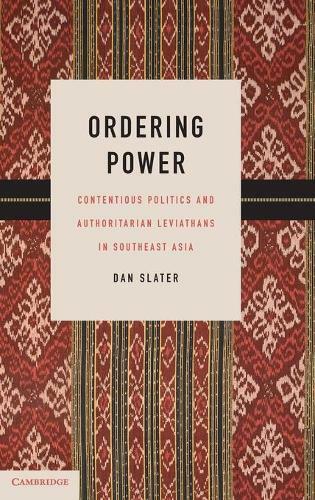 Like the postcolonial world more generally, Southeast Asia exhibits tremendous variation in state capacity and authoritarian durability. Ordering Power draws on theoretical insights dating back to Thomas Hobbes to develop a unified framework for explaining both of these political outcomes. States are especially strong and dictatorships especially durable when they have their origins in 'protection pacts': broad elite coalitions unified by shared support for heightened state power and tightened authoritarian controls as bulwarks against especially threatening and challenging types of contentious politics. These coalitions provide the elite collective action underpinning strong states, robust ruling parties, cohesive militaries, and durable authoritarian regimes - all at the same time. Comparative-historical analysis of seven Southeast Asian countries (Burma, Indonesia, Malaysia, the Philippines, Singapore, South Vietnam, and Thailand) reveals that subtly divergent patterns of contentious politics after World War II provide the best explanation for the dramatic divergence in Southeast Asia's contemporary states and regimes.